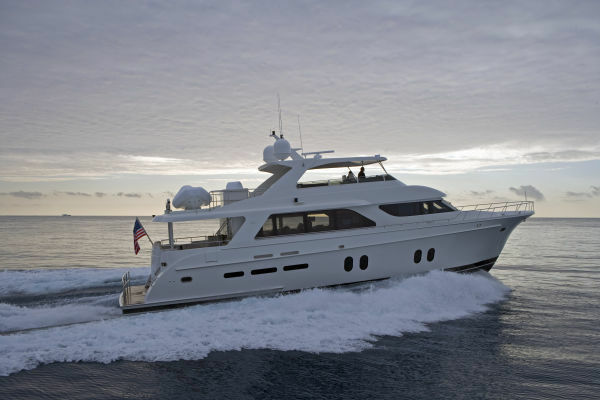 TRIPLE NET is roomy and versatile, featuring four guest staterooms, a spacious flybridge with a hard top, full walkaround decks, a large aft deck and a sizable swim platform. 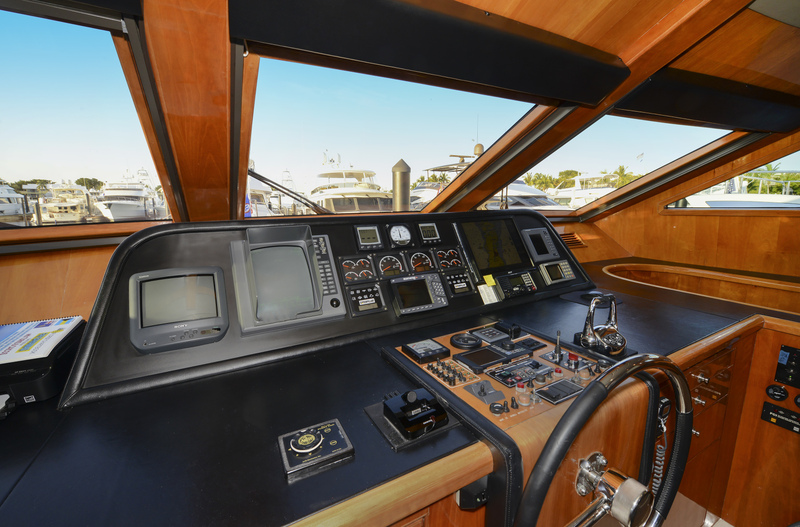 The vessel's open interior layout combines the vintage charm of high gloss wood finish with the luxurious comfort of a contemporary motoryacht. 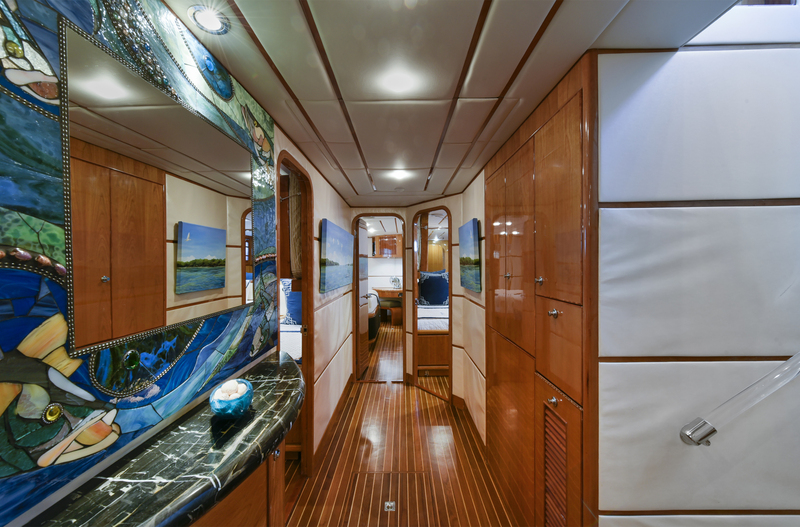 The interior of the yacht has an elegant, comfortable clubhouse décor which is finished in high gloss Cherry wood. 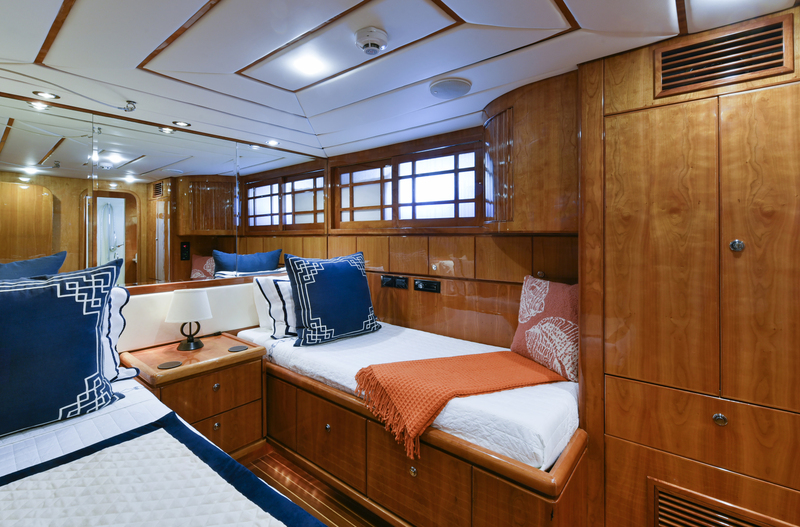 From the swim platform, there is access to the lazarette which features storage for the boat's gear and tools, as well as a full day head with shower and additional laundry. 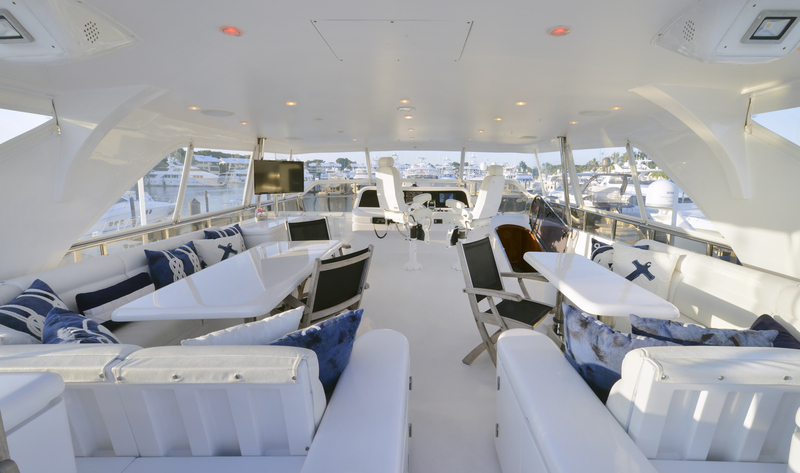 Two stairwells on either side of the swim platform ascend to a spacious aft deck designed for relaxation and entertaining. 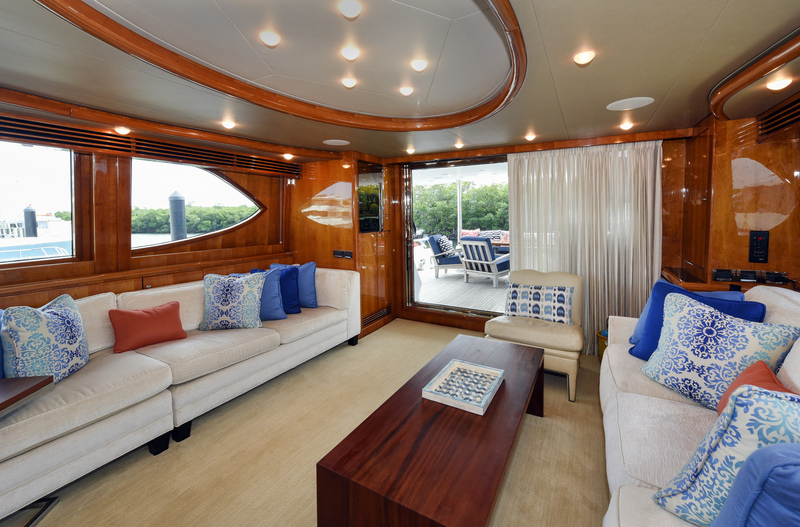 The sliding door opens into the relaxed and casual main salon. 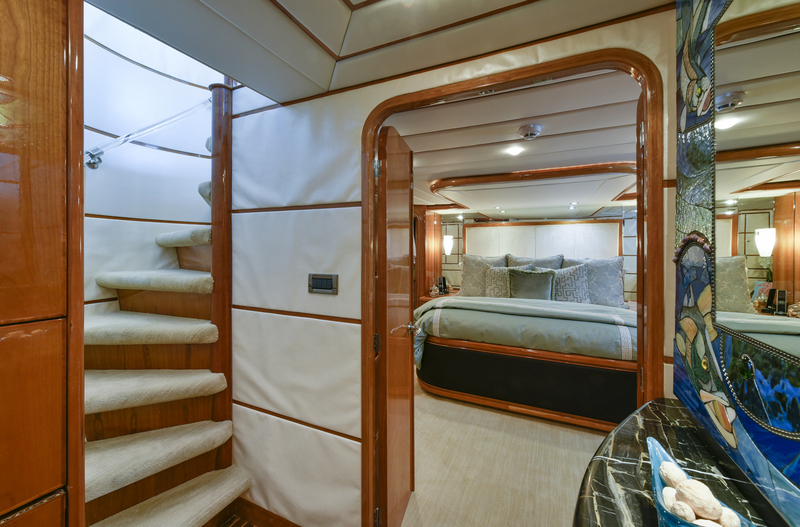 On the starboard side, a spiral staircase provides access to the lower deck foyer. 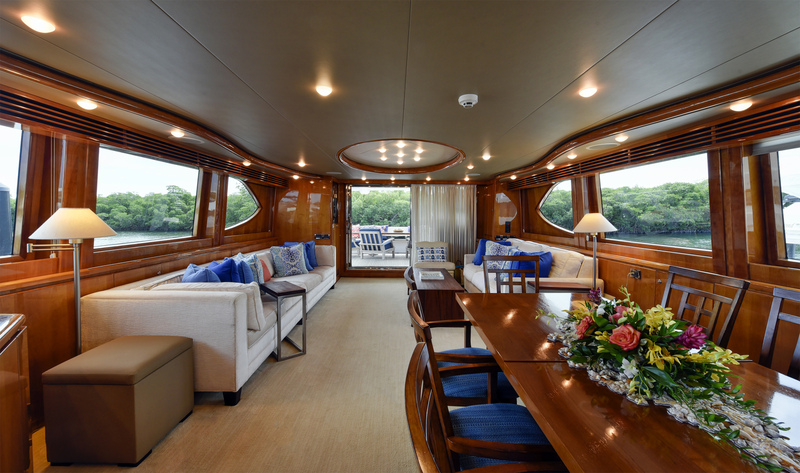 The accommodations aboard his family friendly vessel are versatile enough to host a number of people in several clever combinations. 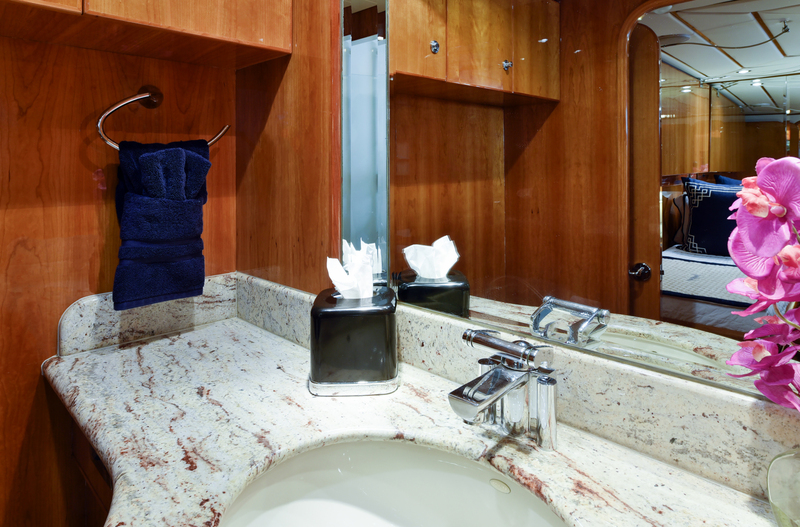 From the lower‐deck foyer, the full beam master stateroom is situated amidships with an ensuite head featuring both a tub and shower. 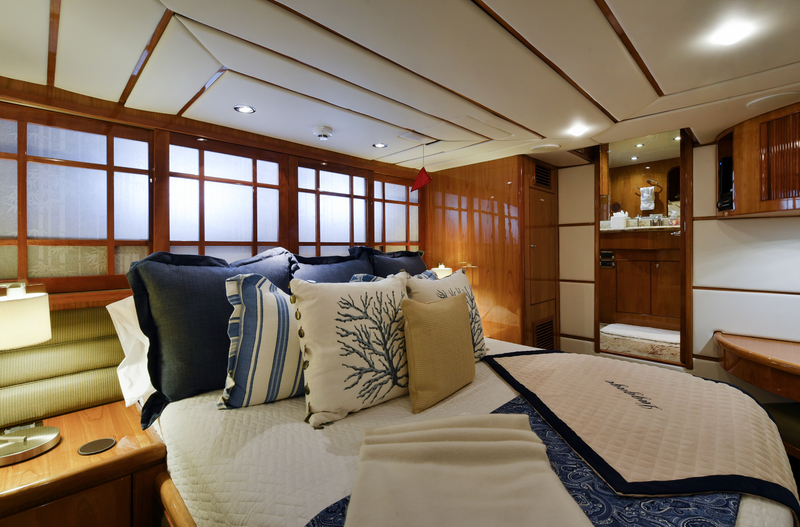 Forward of the master are two substantial twin staterooms with ensuite baths ‐ each of these twin staterooms offer the flexibility of being reconfigured as oversized Queens and both have an additional Pullman berth to accommodate extra guests. 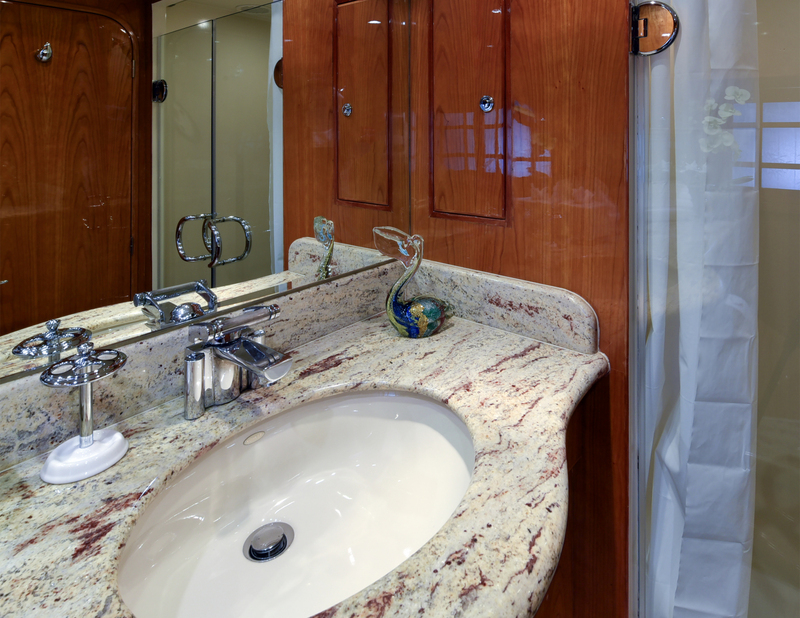 The forward VIP stateroom is comfortable and spacious, and also has a well‐appointed ensuite bath. 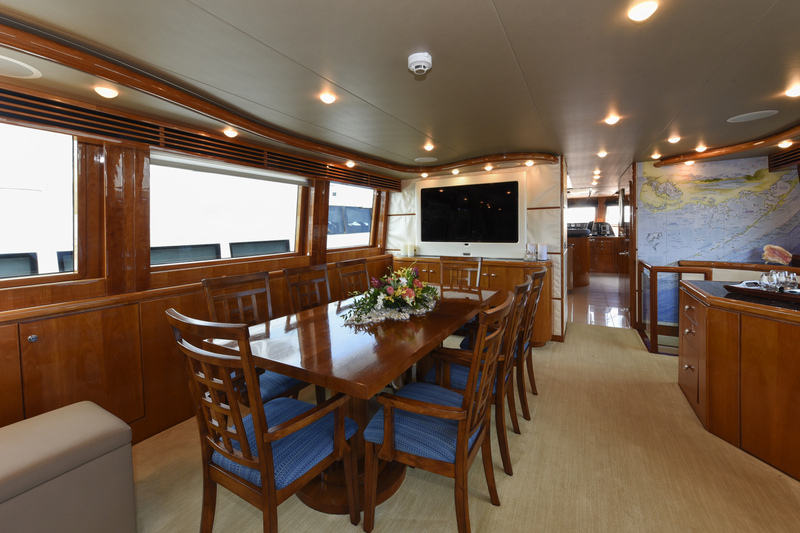 Via a broad hallway on the starboard side of the main salon, are the adjoining gourmet galley and pilothouse which share the panoramic view. 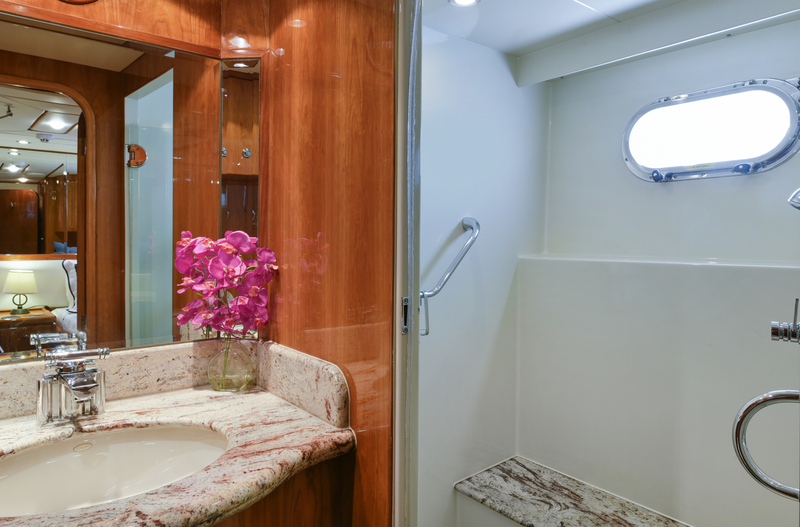 Crew quarters are accessed through a separate stairwell forward of the pilothouse, which three crew are accommodated in two staterooms. 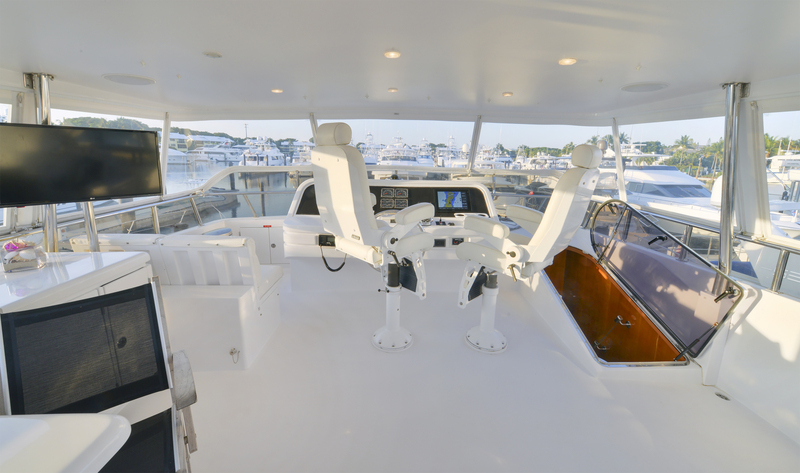 Deck access to the to the flybridge deck is simplified with two full‐size staircases, one internally from the Pilothouse and one from the Aft Deck. 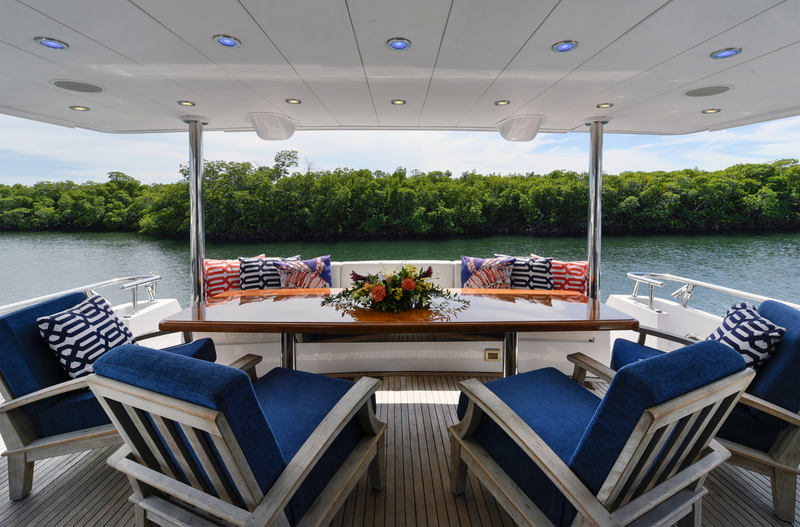 Partially covered with a fiberglass hard top, this top deck features a full‐size grill with two seating and casual dining areas to port and starboard. 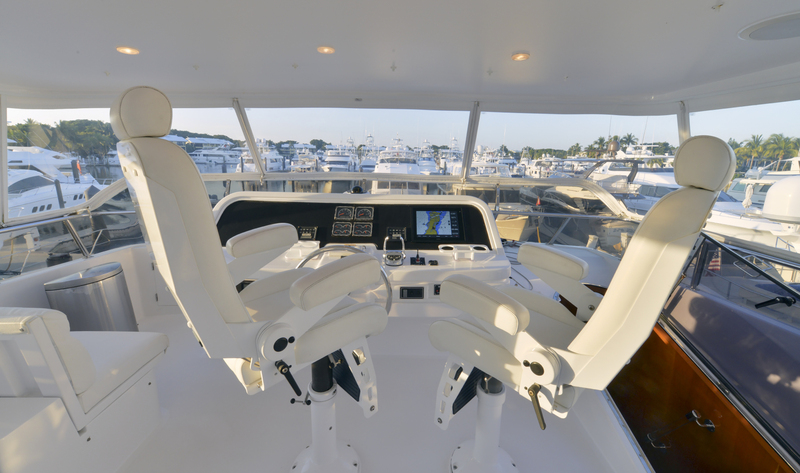 The helm at this deck features a pair of Stidd helm chairs with an additional loveseat for guests to be able to comfortably observe navigation. 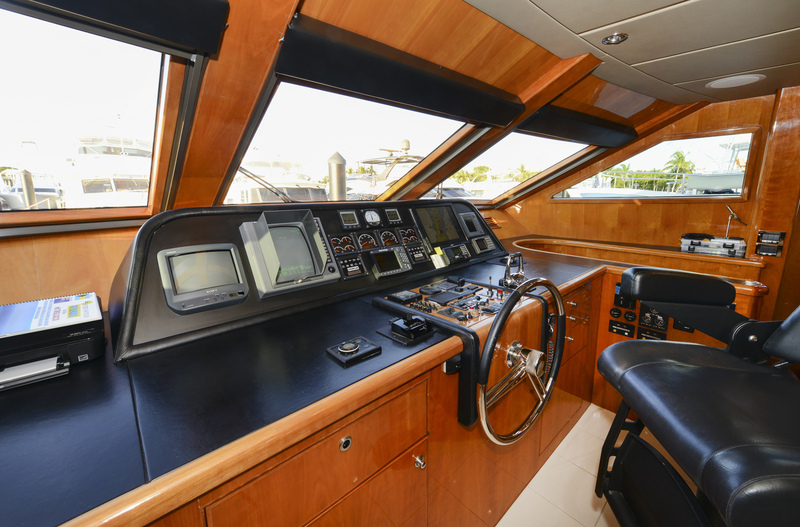 A full complement of navigation electronics is set into the flybridge dashboard for redundancy and ease of use for the captain. 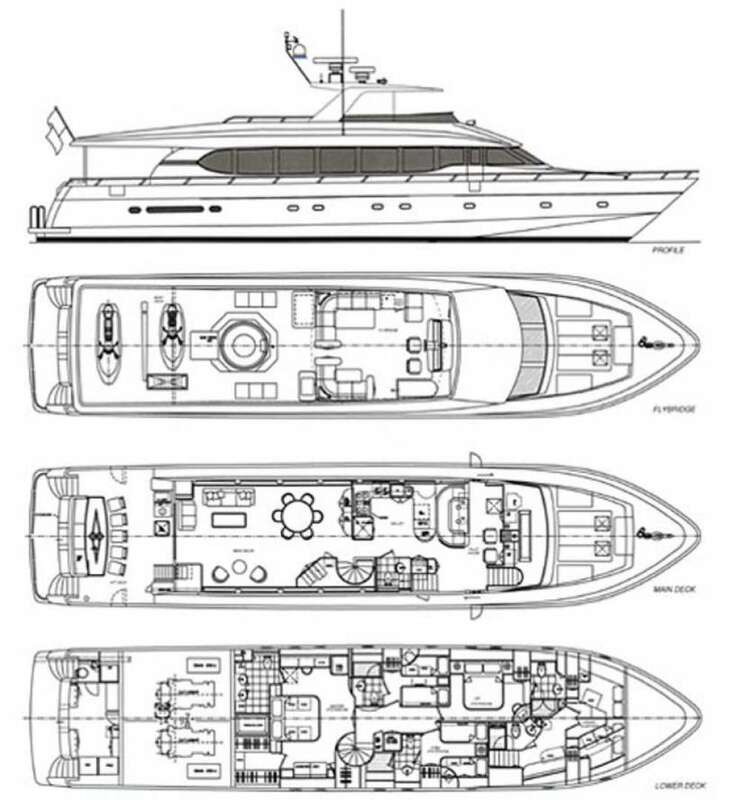 The aft area is another sun‐deck. 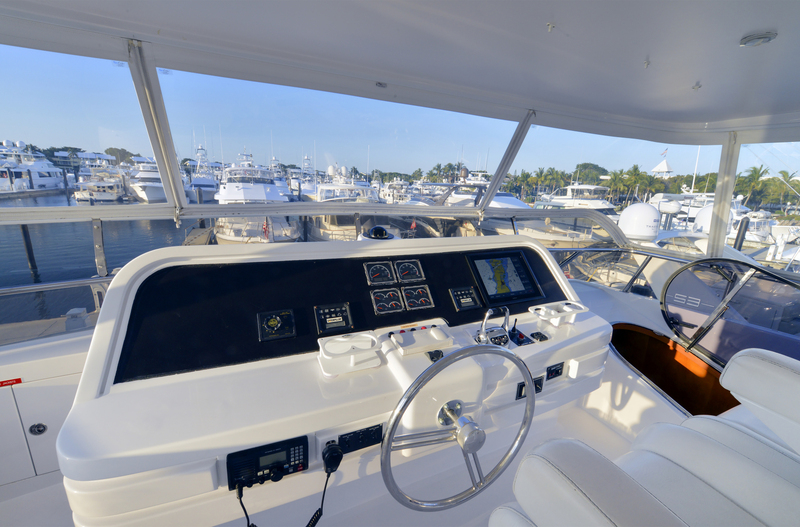 Located aft is the RIB tender and amid deck the Mitzi 17' flats boat. 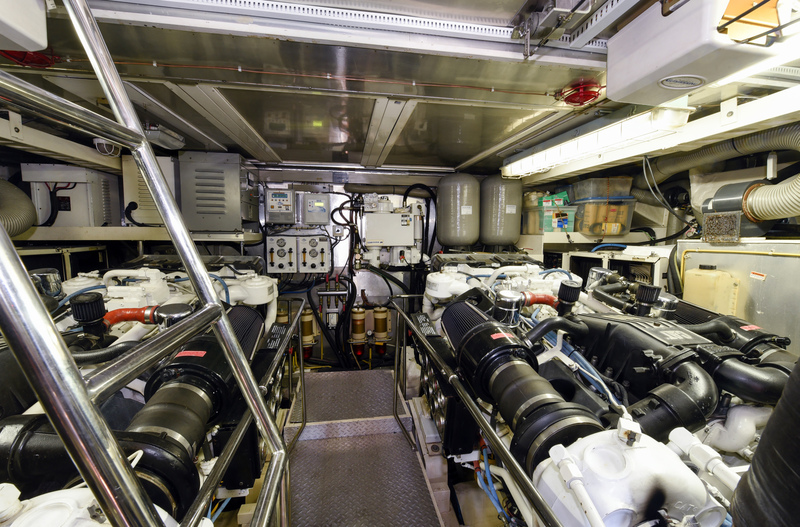 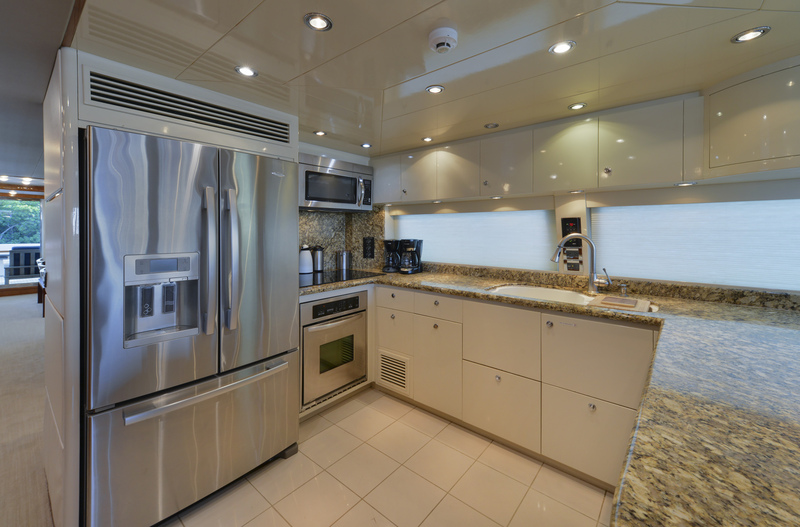 Additionally, on the flybridge deck there is a full equipped wet bar, a compact refrigerator, Quick Life 1600 lb. 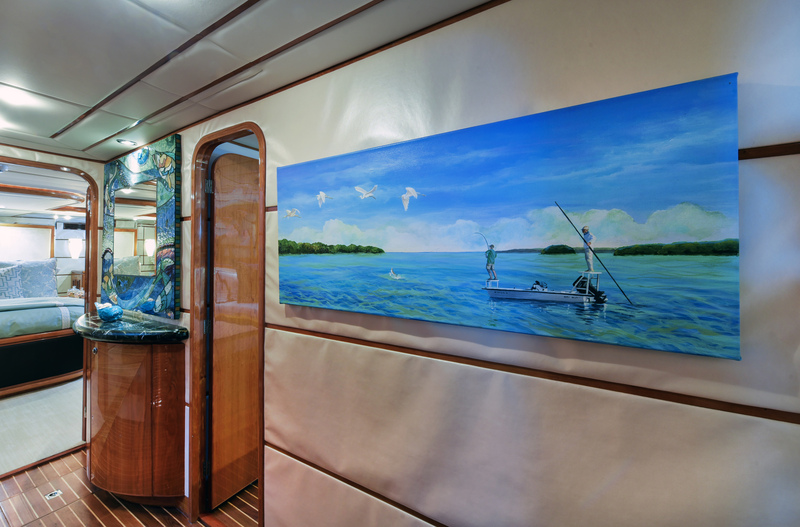 low profile davit, and a freezer. 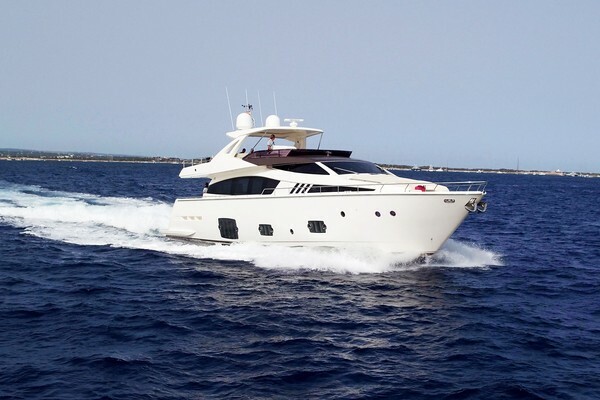 gourmet capabilities to suit the most discriminating chefs. 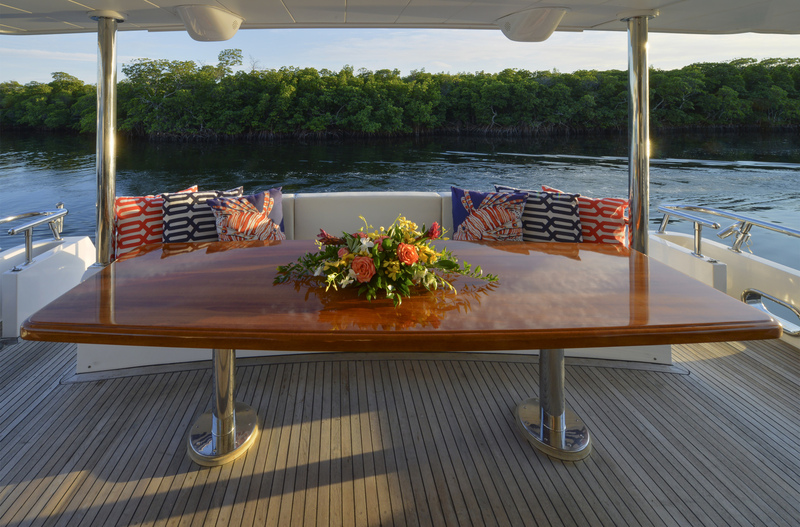 The large galley is open to the forward helm area which features a U‐shaped dinette with a matching granite table top which comfortably seats up to five people for casual dining and offers an expansive view out of the three forward windows. 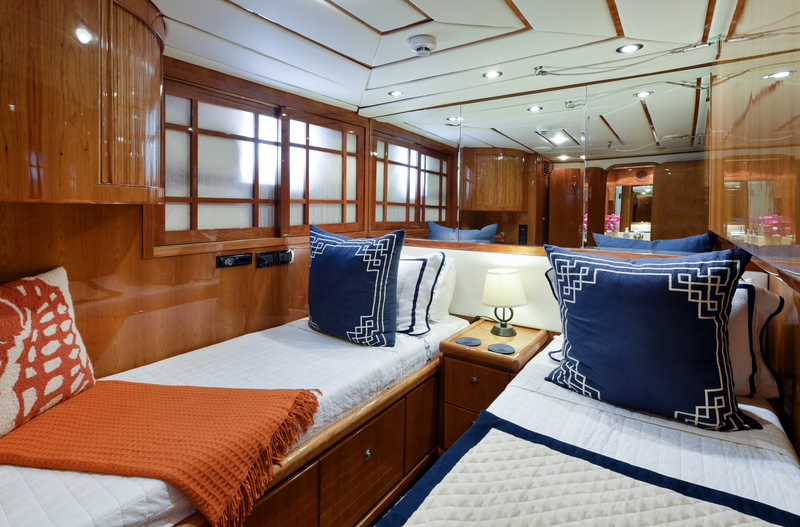 This full‐beam master stateroom features a central King‐size bed, a small sitting area, a vanity with a padded ottoman and plenty of storage spaces for your personal effects. 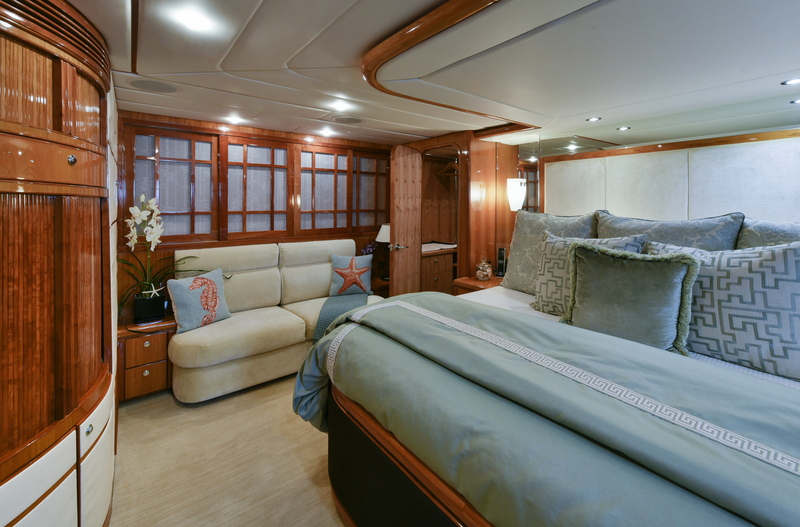 The stateroom offers privacy with Shoji screens over the port holes, a personal entertainment system and a huge walk‐in closet. 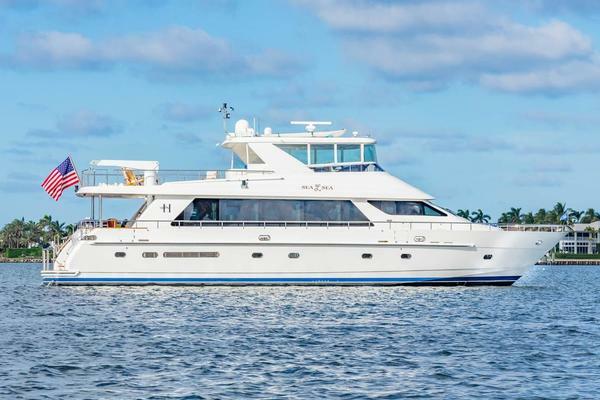 the split plan aft consists of a walk-in closet to starboard and an outstanding master bath to port complete with his and her sinks, a light "sandy" granite counter, marble floor, and custom‐made shower and tub. 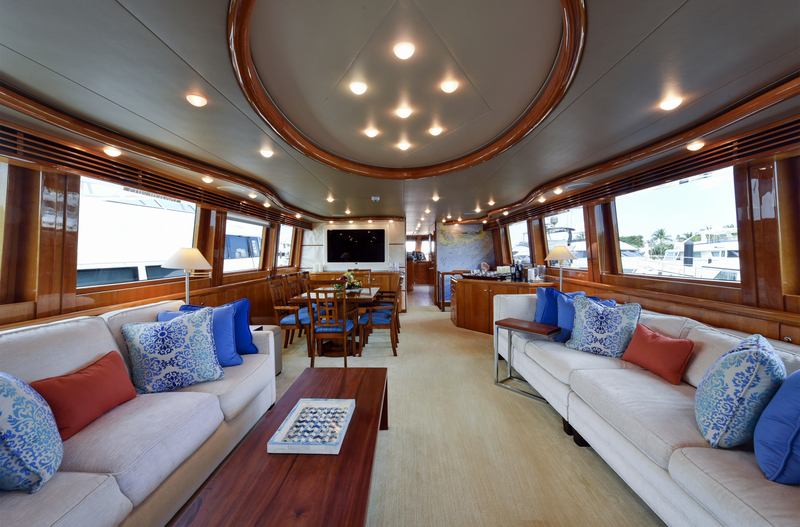 Finished in gloss cherry wood, padded ceilings, and light carpeting, twin berths sit flush against each wall with a small night table in between. 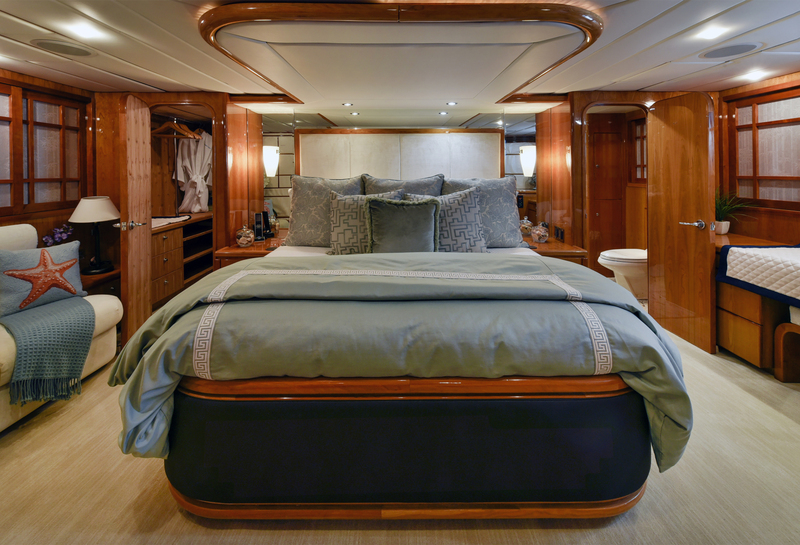 This arrangement is quite versatile in that these beds can slide together to form an over‐sized Queen with the additional flexibility of a Pullman to accommodate occasional extra overnight guests. 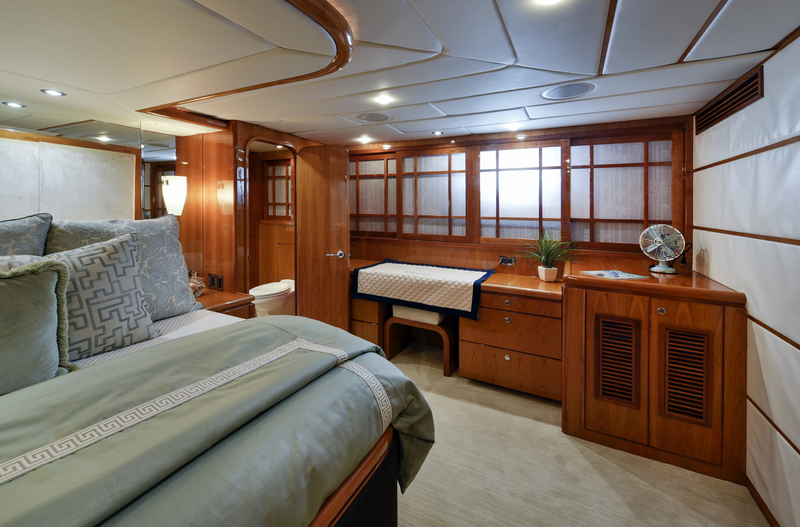 This stateroom features under‐bunk storage and a hanging closet as well as a personal entertainment system and an ensuite head with shower. 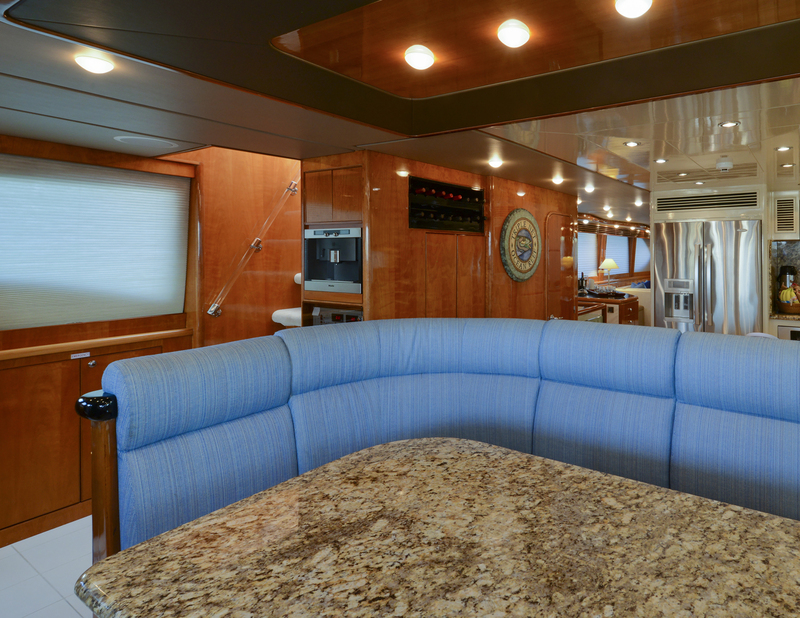 The large lazarette is accessible from the swim platform and provides a tremendous amount of storage space for provisions, tools, supplies, and toys. 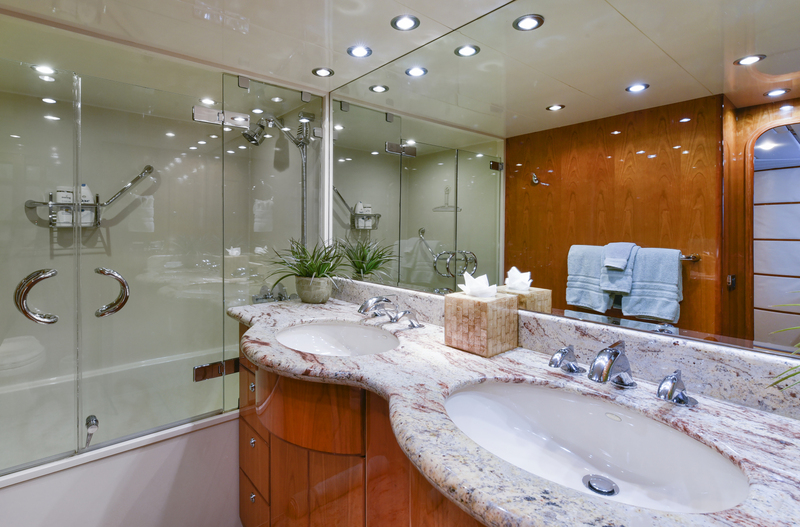 To port is an additional head with sink and shower, which is convenient for guests heading to or returning from the beach.